This week is Obon week in Japan which is a national holiday week for folks to come home and visit relatives. I noticed in the used music shops that more gear is coming through the door so it’s likely that people have free time to pawn their gear. Today I found a mint condition Yamaha CS-10 with case and two manuals for $150. One manual looks like a sound creation manual and the other is titled “Yamaha Rock Keyboard School” written in Japanese of course. Since getting the Roland SH-01 last month I have grown fond of these dynamic monophonic synthesizers of the past. The Roland SH-01 has been a blast to play with and I equally but differently had fun playing with the Yamaha CS-10 in the store. One of the things right away that I liked about the Yamaha CS-10 was that it was built very solid and the keys were exceptional. I also found the knobs easy to turn and everything was laid out very nicely. Sound wise, the Yamaha CS-10 is phat “enough” that when you add effects such as delay, chorus, or other that it will fatten up nicely to expectations for sure. My thinnest analog synthesizer at the moment to my ears is my Korg Poly-61 which doesn’t mean it’s bad at all but with effects it’s awesome. The Yamaha CS-10 sounds different than the Sh-01 for sure but different is what I want when I have two kinds of similar synths. Seriously though, I don’t wish to compare the Yamaha CS-10 to anything that I already have because just having a different synth is one of my main goals of course. The main features of the Yamaha CS-10 that I really like are first the LFO SPEED and LFO MOD functions. You can get some great grooves going that with a skilled player can allow you to create some nice arps and bass lines. Note that the CS-10 does not have an arpeggiator but the LFO does nicely as an alternative for those wishing to get some automation out of the synth. If you couple the LFO with the “Hold” function you can add to that experience very well. The LFO can be switched to either “Saw-tooth” or “Sine” waves which both are very musical. I prefer the Saw-tooth wave for that punchy arp synthbass sound ala 1980’s synthpop. I also really happen to like the “Portamento” slider which is very smooth and glides really well. I tend to use the third notch from the bottom to give it a nice bit of character to basslines. The bass grooves come alive and flow well. Anything higher than that will create more unexpected portamento results which are also good if you like that much unpredictability. Next to the Portamento is the Pitch Bend which is actually a slider and not the more popular wheel or joystick on other synths. While I prefer a wheel or joystick like on my Roland SH-01, the fact that it’s different on the CS-10 provides for additional creative uses. The pitch bend is not as smooth or I should say it’s harder to move in a fast smooth fashion, but if you slide it from the bottom up it creates some fantastic synth rise sounds. Another great feature on the Yamaha CS-10 is the Mixer which combines the EXT in and NOISE functions of the synth. Adding a touch of noise really creates character and there are some great ways to modify the sound here. I haven’t experimented with the EXTERNAL INPUT yet, but I’ve heard nothing but great things about it. So far I haven’t experienced any tuning issues or scratchy pots. The Cutoff and Resonance are all good. The Time x5 button is cool and seems to “phatten” up the sound a bit more as does the PWM button and knob. As I mentioned the three octave keyboard is excellent and the overall size of the Yamaha CS-10 is quite small so you can stick it pretty much anywhere in your setup. I’ve heard pretty consistent “good” reviews about the Yamaha CS-10 and the CS line as whole. Of course there are some more popular models out there such as the Yamaha CS15, CS30, and CS80, but like with all my gear I buy it if I see it and only if it’s a bargain price which granted is pretty easy in Japan. So far I have not seen a CS15, CS30, or CS80 around my neighborhood. The Yamaha CS-10 however is a nice “basic” synth that will work great particularly with analog synthpop basslines from the 70’s and early 80’s that I’m particularly fond of. As I’ve said before, it’s amazing the quality, condition, and prices of vintage music gear you can find in Japan. You just never know what you’ll find next when you walk into the doors of these used music shops scattered along the countryside of Japan. Have a great week! 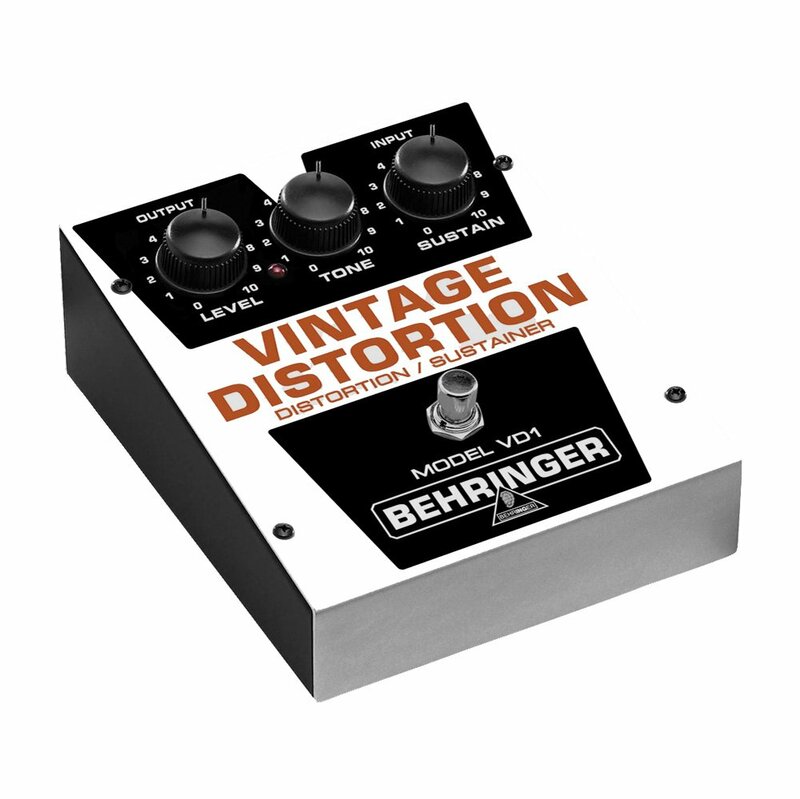 I found this neat used pedal for five bucks today called the Behringer Vintage Distortion VD1. I hooked it up to my Korg Poly-61 and found the distortion I’ve been looking for to phatten up some of the sounds. I understand one has to be careful of the build and sound quality of Behringer, but I was pleasantly surprised at how decent it sounded with my analog synths. I think the VD-1 distortion is suppose to emulate the Big Muff Distortion in some way, but since I’ve never used a Big Muff, I can’t comment whether that is correct or not. Likely it doesn’t if I had to place my bets. Still though, the VD-1 is pretty cool for adding some flavor to your synth sounds or if you just want to dirty them up a bit while retaining the underlying sound. I found the VD-1 was not that muddy at all really. You do need to watch the reverb though as VD-1 distortion can trail a bit which can give the synth sound a bad “after taste” I like to call it. Unless you are looking for that I find running the distortion along with minimal effects on the synth voice to sound the best. One thing I’m not sure about is whether this pedal is analog or not. I just got it and a quick search on Google didn’t turn up any info. If I find out I’ll post an update here. Overall the Behringer Vintage Distortion VD-1 is pretty decent for synthesizer use. Please feel free to add your experiences with this pedal and synthesizers. 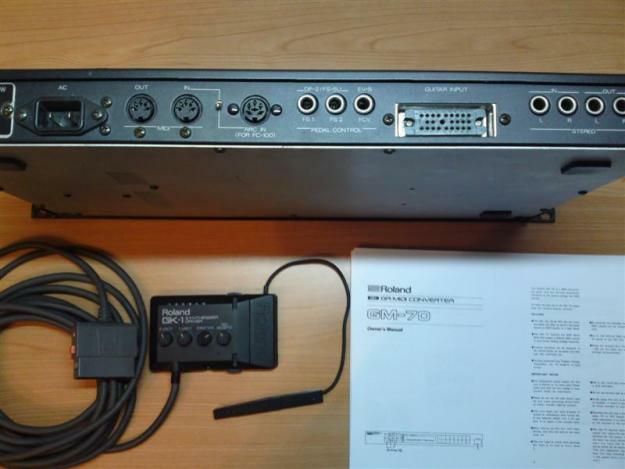 Early this week I found a used Roland GM-70 Midi Converter and GK-1 Kit sitting on the shelf labeled as “junk” in a nearby used music store. 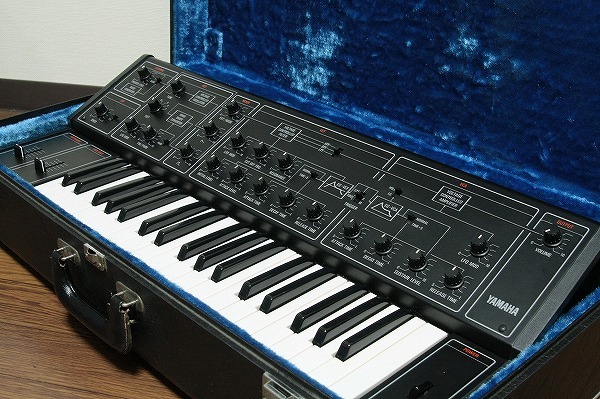 The GM-70 is just like the one in the attached photo along with the GK-1 synth pickup. The guy at the store said he didn’t know if it would work which is why they priced the GM-70 and GK-1 together for $30 bucks. I’ve seen the Roland GM-70 on Ebay sell for a much higher price and I’ve also only seen the GK-1 a few times. Also, in addition to the GK-1 24-pin cable, another regular 24-pin cable on each end came with the setup so for the $30 price tag I figured it was a pretty good deal. Currently on my Fender Strat I have a GK2a pickup that runs into a GR-33 or GI-20. When I was younger I started out as a guitar player and then eventually moved over into keyboards. Thus I have a fascination for synth guitars although I find it lately to be much easier to simply use the keyboard to play in the parts. I kind of wanted the GM-70 because I often see Roland G-707 guitar controllers in Japan but they require the 24-pin cables. I now have a GK-1 with a 24-pin cable attached and a regular 24-pin cable that could be used to attach a Roland G-707 to the Roland GM-70. This would be kind of cool provided I find another G-707 shortly. I was able to attached the GK-1 pickup right in front of the GK-2a pickup which surprisingly they both fit nicely together on my Fender Strat. I didn’t have to fiddle with the string height very much at all. I then stuck the GK-1 on the back of the Strat and then connected the mini guitar cable from the GK-1 to the Guitar output jack. The Roland GM-70 supposedly was marketing along with the Roland GP-8 effects processor which I also have so I was able to connect them both. The Roland GM-70 started right up beautifully and for testing purposes I midi’d up the GM-70 to a second Yamaha TX81z FM Tone Generator. Right away I was able to get sounds and the tracking was about 90% right on. With some minor adjustments to the volume screws and adjusting the strings a tiny bit more I was able to get some pretty good results mainly with synth oriented sounds and pads. Some sounds are just not meant for synth guitars but most sounds I test on the TX81z were pretty good. So like most used gear I find here in Japan, the Roland GM-70 and GK-1 pickup worked fantastic. Yes it’s older technology and a tad bit slower on the Midi, but again to me it all depends on the synth voice you are using and how you are using the guitar synth. For those not familiar with playing a guitar synth, you have to find common ground between playing like a guitar player, keyboard player, and coming up with a new picking style. With limited experience I have with guitar synths I was able to get some decent results that could be improved greatly with additional practice. The 24-pin GK-1 cable worked great and I’m sure the regular 24-pin cable I can use with a Roland G-707 will work just as good. I don’t play guitar synths all that much to be honest, but for the price of this hard to find old gear, I felt it would be nice to have in case I did want to fiddle with guitar synths more. Of course there is quite a bit of newer technology around that likely works much better, but it’s also pretty expensive for stuff that I find still exhibits the same issues like tracking and funky notes being heard. If I think about it, I think I actually found myself fiddling less with the Roland GM-70 and GK-1 than I usually do with the GI-20 and GR-33. I won’t go so far as to say which unit is better, but I will say that the Roland GM-70 and GK-1 setup is still a decent solution for anyone wishing to experiment with Guitar Synth Technology. Just try not to think too much like a guitar or keyboard player. You need to create your own style and that to me is the fun part of guitar synthesizers. Enjoy! Long ago when I was a kid I always had a dream about owning the big three 80’s Keyboards which in my mind were the Yamaha DX7, Roland D-50, and the Korg M1. All are classics and superb keyboards in their own colorful way. Today I finally broke down and picked up the Korg M1 which completes the trio for me and it’s wonderful to finally have them all to work with. Granted these are not the latest and greatest synths, but in their time they were very popular. As a kid growing up listening to music created by these machines, I knew quite a bit about them but they were of course quite expensive. The only one I did happen to buy in the 80’s was the Yamaha DX7 for a couple of grand. I later sold it after University only to find another here in Japan not too long ago. The Roland D-50 I found in Yokohama about 10 years ago and still have it with me to this day. In my previous article I wrote about the Korg M1 for sale which is the one I went back and purchased. I got it at a lower price because I mentioned that the LCD backlight had almost completely faded. I also noticed that a couple of the red LED lights were not working brightly either so I walked out of the store with the Korg M1 and a sizable discount. When I got home I started up the M1 and right away noticed that the LCD was bright and that the red LEDs were now showing. I figured what must have happened was that the power supply in the old music shop was not working well or the power cord they used was not correct. They did give me the original M1 power cord but it was in another bag. So I’m thinking I lucked out and discovered simply that the power supply was low in the shop. The Korg M1 is absolutely in mint shape. Apparently a girl from Canada owned it before in Nagano here and she really took great care of the workstation. The keys, joystick, LCD, buttons, sliders, and M1 casing are all in scratch free condition. I probably paid a tiny bit more than I usually do for a set of used keys, but I honestly don’t think I would have been able to find another Korg M1 in such great condition. This particular Korg M1 is not the EX version but rather the original stock model. I’m ok with that as the original presets were part of what I wanted. I see the M1 cards quite a bit in Japan and so likely I’ll pick up a few at cheap prices eventually. I also like having the keys because I like to play keyboards like this rather than having the rack module. It’s just fun for me I think and so I’m excited to have the keyboard version. Currently I have the Korg M1 setup with my Korg X3 side by side. They are both a lot of fun to play and the sounds on the M1 are still gorgeous sounding in my opinion. Some sounds may be dated to others but for me they are brand new to my fingers. Piano 16′ and Organ 2 are house classics. I also like all of the E. Pianos and even the basses are pretty good. Of course the pads, choir, and ambient sort of sounds are excellent with the M1 as well. One of the main attractions for me to the M1 is the sequencer. I prefer to work with patterns and I love the add/remove ability on both the M1 and X3. It’s just super easy to lay down tracks instantly and groove or solo on top of them. The key bed is also really great on the M1 and it’s quite easy to quickly do runs up and down the keyboard. For editors and librarians, I am currently using Midi Sound Quest XL 10 with my Apple iBook G4. It works perfect for transferring sounds and sequences to and from the Korg M1 and X3. There are a ton of sounds out there on the Internet and it’s going to be fun this weekend combing through all that’s out there. Finally having the Korg M1, Roland D-50, and Yamaha DX7 is a dream come true for me. I graduated from high school in 1986. When I left for University never did I think I’d be able to acquire such gear because at that time it was hard to find any used keyboards at a reasonable price for a kid in college. Nowadays there is a lot of old gear out there and they sure are a lot of fun to learn about and play. The other day I was in a used music shop here in Nagano-city Japan and I ran across a used Korg M1 Workstation in mint shape. The asking price for it was $485 and I reluctantly passed it up. I asked the sales clerk if he could come off the price as it seemed a bit high compared to prices found on Yahoo Japan Auctions. Korg M1 Workstations are pretty high priced on Ebay right now at around $500 to $600 but I don’t see any selling for that price in the completed listings. As a result I skipped the opportunity and instead went home and dug out my old Korg X3 which is still in rather excellent condition. I turned it on and everything worked great except the floppy disk drive. It worked previously but I guess storage has caused it to break down. I opened up the Korg X3 and found that the rubber floppy belt inside was still intact and in rather good condition. I figured it might be stretched out to much and so I ordered a new one online for 10 bucks to replace it. I already tried a rubber band which worked on my Yamaha SY-77 once before, but no luck with the Korg X3. It doesn’t look like the drive itself is broken so hopefully it’s just the drive belt that needs to be replaced. When I get the belt I’ll update this article with the result. The software editor and librarian I use with the Korg X3 is Sound Quest Editor/Librarian 10 XL. I run it on an older Apple iBook G4 OSX 10.4.11 which works perfect for most of my older synths. I have had no issues at all transferring programs, combinations, or sequences to and from the Korg X3 and the Apple iBook. It’s also easy to record the midi tracks into Pro Logic 8 which I also have on the iBook G4. So if the floppy disk drive can’t be fixed, then it likely won’t be too much of a problem. I really like the Korg X3 actually. It’s perfect for that New Jack Swing sound of the 90’s. I would love to snag a Korg M1 or M1r one of these days when I find a good price. Five hundred just seems a bit much for a Korg M1 but maybe some people might not think so. I’m not sure. I also have “imitation” sound programs of the Korg M1 and Korg 01/W for the X3 which were found on the Korg UK website. They sound pretty decent and will work. The key bed is also fantastic on the X3 and is made by Yamaha. It’s very similar to the one on the Yamaha DX7 and I’m curious if it’s the same. It sure feels like it. I also like the sequencer very much as well which is very easy to program and has an adequate 10 song / 100 pattern memory for laying down tracks and ideas. 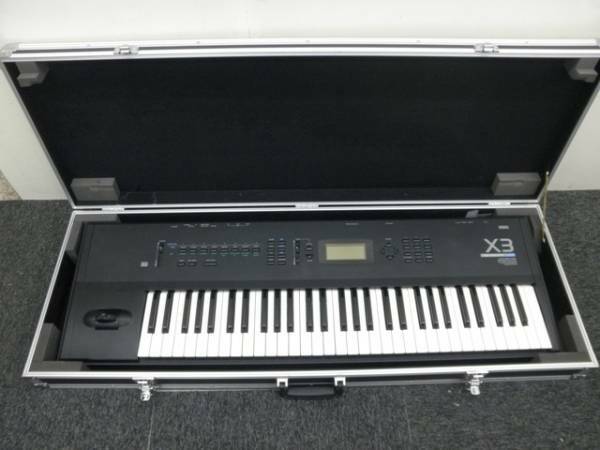 I remember buying the Korg X3 used back in 2000 in Tokyo. I bought it for a really cheap price because it wasn’t selling in the used shop. The sales clerk said nobody wanted it and so I figured I would take it off his hands. I’ve kept it ever since and likely will not sell it. For that 90’s sound it really is great.